Custom designed with handmade Afrormosia hardwood case as in the original VCS3. 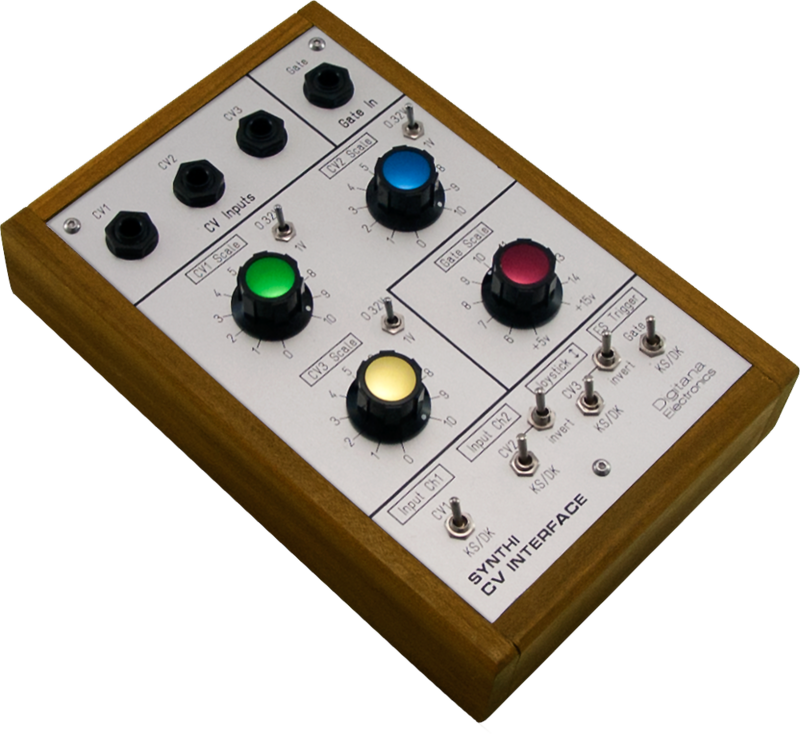 The Synthi VCS3 CV Interface (Mk2) unit allows individual switching of the four channels (Input Ch 1, Input Ch 2, matrix row 16 (joystick vertical control) and gate) between either external CV sources (CV1 to CV3), external gate source or the CV and gate from the Keyboard (DK1/2) of the VCS3. The unit has two voltage inverters. The first allows inversion of CV3. The reason why I added the invert option is because the Synthi VCS3 (and AKS) all require negative pitch voltages to control oscillation frequencies via Input Ch 1/2. This is because these channels actually invert any signal passed into them. For proper pitch control of oscillators when using the CV3 channel, it is necessary to invert CV3. 'Proper' control means increasing positive CV3 to give increasing oscillation frequency. Flicking the CV3 invert switch off (so CV3 is no longer inverted) gives the opposite control whereby more positive CV3 pitch voltages give lower frequency oscillation pitch. A bit like a backwards keyboard! This setting is still very useful for producing weird effects or if you want to use CV3 to control things like filter frequency etc. The second inverter acts on Input Ch 2 voltages from the DK1/2 keyboard. This allows inversion of the trapezoidal dynamic envelope that the keyboard of the AKS generates via Input Ch 2 when the keyboard is played. It’s useful when using this keyboard generated envelope to modulate things other than output channel levels. The power for the unit is taken from the VCS3 itself via the jones socket and is very minimal since it's just a few milliamps that are needed for the opamp voltage inverters. The unit features precision 25-turn trimmers accessible from inside, that allow precise adjustment of the 0.32V/octave CV scaling (as opposed to the standard 1V/octave scaling found on most synths) needed to play chromatic pitches via external CV sequencers etc. Toggle switches on all three CV channels allow either a 1V/octave scale range or a 0.32V/octave scale range to be used. See the user guide for more details. You could have an external sequencer send pitch sequences via CV3 controlling, for example, osc1 via row 16 of the matrix. Another sequencer could send pitch to CV2 which could control osc2 via Input Ch 2 and finally still have keyboard control of the keyboard oscillator via Input Ch 1 with/without the possibility of external processing of this osc. The triggering of the Envelope Shaper could either be by an external gate or the DK1/2 keyboard. The other feature on the unit is the ability to invert (or not) CV3. The reason why I added the invert possibility is because the VCS3 and Synthi AKS all require negative pitch voltages to control osc frequencies via Input Ch 1/2. This is because these channels actually invert any signal passed into them. The ability to still be able to play the DK1/2 keyboard and have at the same time external pitch sequences to the VCS3 oscillators means that with this unit, the VCS3 Mk2 can operate a bit like the Synthi AKS where you could have a sequence running on one oscillator and at the same time play accompanying notes from the the AKS keyboard via another oscillator. The power for the unit is taken from the VCS3 via the jones socket and is very minimal since it's just a few milliamps that are needed for the opamp voltage inverter. 'On the Run' Your browser does not support the audio element. A special version is available for use with a VCS3 Mk1, because this (as a Mk1 unit) does not have the feature that row 16 of the matrix can double as either joystick vertical control or a CV input. The VCS3 Mk2 (and Synthi AKS) have this feature. So for the VCS3 Mk1, a special pin cable has been designed to carry CV3 to the matrix.